Combine cheese & heavy cream in sauce pan and reduce by half. Add ½ c stock & simmer. In separate pan heat remaining stock and add shrimp, scallops & lobster. Cook until just done (about 3-5 minutes). Add sherry and simmer another 2 minutes. 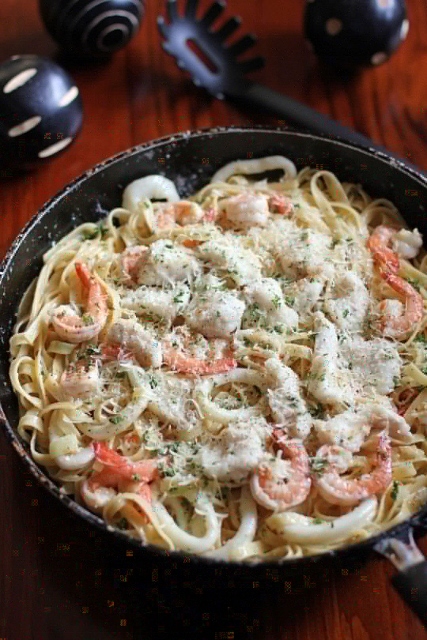 Add seafood to sauce (do not add juices from seafood pan). Top with fresh bread crumbs & broil to brown. Place shrimp into a non-reactive bowl. Combine all marinade ingredients and pour over shrimp. 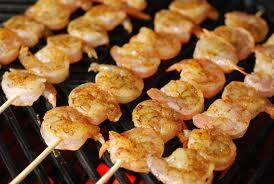 Marinate shrimp & soak skewers in water for 30 minutes. Place a pineapple chunk at the underside of the shrimp. Slide shrimp onto skewer (3-4 per skewer). 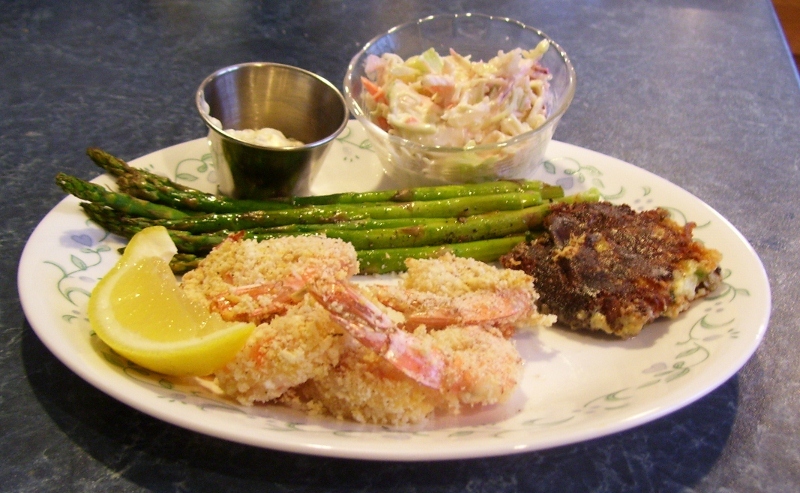 Grill for 3 – 5 minutes per side or until shrimp are opaque. Combine crackers, parsley, cheese, lemon juice, worcestershire & crabmeat. Line the bottom of a gratin dish with a little sherry. Butterfly each shrimp & stuff with cracker mixture. Place shrimp in the dish, tail end up. Dot each shrimp with a little butter. Meanwhile melt & clarify remaining butter. Remove shrimp from oven and garnish with lemon slices & parsley. Serve with lemon wedges & drawn butter on the side. This version of Shrimp Cocktail, will blow your guests away. The original recipe came from Giada DeLaurentis. I changed just a few ingredients to give it a little more depth of flavor. Thank you Giada for the base recipe! Season shrimp with herbs, oil, salt & pepper. Allow to rest for 30 minutes @ room temperature. Cook shrimp 5-8 minutes until just cooked through. Place sauce into a small bowl & place on platter. Combine all ingredients & set aside. I recently visited a friend in Deltona Florida. 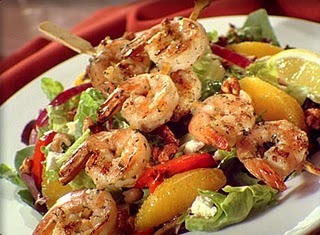 Upon my arrival we went to a restaurant called “Two Blonde’s & a Shrimp.” We both ordered this divine salad. The vinaigrette was so delicious I asked for the recipe. Unfortunately, the chef had stepped out; so we proceeded to decipher the recipe on our own. This is what we came up with. Thanks for the salt Sherry!! **Keep in mind the ingredients for the dressing are estimated (but pretty close). I’m very much a “Rachel Ray” & tend to throw ingredients together until they taste good. Also, “real” coconut milk is usually solid when you open the can. Don’t panic! Just put it in a bowl with the rest of the ingredients & whisk it well. As it warms, it becomes less solidified. Combine all ingredients in a jar with a fitted lid. Refrigerate 15 minutes to blend flavors. Remove the dressing from the refrigerator while preparing the salad. Drizzle shrimp with EVOO & season with salt & pepper. Skewer the shrimp 6 to a skewer. Grill 2-3 minutes per side. Divide all ingredients, except the shrimp, equally onto 4 plates. Place 1 skewer of shrimp on each plate. Shake the dressing & divide between 4 ramekins. Place a ramekin of dressing on each plate & serve immediately. NOTE: The eclectic ingredients may seem strange to some. However, in the correct quantities, they compliment eachother extremely well! The trick is not too much of any one ingredient. Drizzle with oil & toss to coat. Combine Panko with salt, pepper & a pinch of dried Italian seasoning. 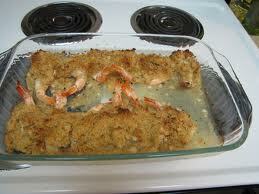 Dredge shrimp in crumb mixture. Lightly drizzle with more oil. Serve with tarter sauce & a lemon wedge. Combine all ingredient & let stand while making shrimp.